Find hotel near Dingo Beach And Hideaway ..
A perfect get away for a day trip from Airlie Beach and its small beach area is the sandy haven called Dingo Beach and its sister town Hideaway Bay. Located north from Proserpine on the Whitsunday Coast, the areas offer miles and miles of white sands and pristine waters, secluded locales with great views. Calm and tranquil with shaded trees lining the area, one can just kick back and relax here. For those looking for some activities, fishing, snorkelling and swimming in the stinger-free enclosure are all perfectly suitable. The beach also has a public boat ramp, barbecues and picnic tables. A few modest beachfront restaurants and bars are located in the area. 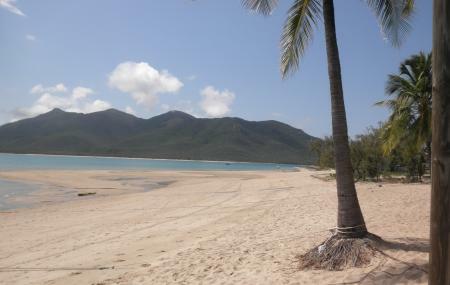 The towns of Hideaway Bay and Dingo Beach are only approachable by car, which one can easily hire at Airlie Beach. For an overnight stay, there are two eco resorts at Cape Gloucester and some private home accommodations in the area. One can only reach the area by car, as public transport does not ply here. How popular is Dingo Beach And Hideaway Bay? People normally club together Horseshoe Bay and Big 4 Adventure Whitsunday Resort while planning their visit to Dingo Beach And Hideaway Bay.